" "We continue to be pleased with the service provided by Protex. It really works!" "
← Pests Find Pet Stores Irresistible! Termite Control - Houston Texas has Termites Big Time. …………For a long time it was thought that the average subterranean termite colony contained about 250,000 termites. In phenomenal situations these colonies might have as many as one million individuals, it was thought. But in the last dozen years or more, new research has shown that we were drastically underestimating termite colony sizes. Dr. Grace has evidence that colonies can consist of up to 3.2 million termites. These were estimates done in Canada, where you would expect termite colonies to be smaller than warmer areas. Working in Florida, Dr. Su has shown that some native U.S. subterranean termite colonies actually reach 5 million termites! Why is termite colony size important? Larger colonies can cause greater damage in a shorter period of time than smaller colonies, and they can be eating wood in a larger area–perhaps in several neighboring homes all at once. 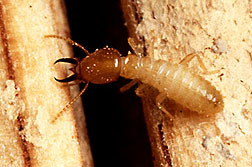 A large colony of 3.2 million termites can consume over 1 1/2 pounds of wood every day, and they are able to find and infest unprotected wood in an area covering 2 1/2 acres! Formosan termites, which are spreading every year, have even larger and more destructive mature colonies, ranging from 2 to 10 million individuals. They can tunnel an amazing 110 yards–the length of a football field! Formosan termites can cause significant damage to a home in just 6 months, and have been know to actually take down a home in as little as two years. When was your home last inspected for termites? Call today for termite inspection and expert Houston termite control.